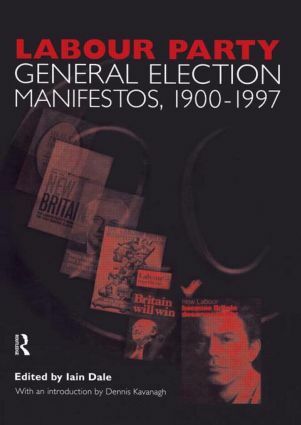 This volume brings together for the first time the British Labour Political Party General Election Manifestos, dating back to 1900, and including the most recent General Election manifesto of 1997. The project provides an indispensible source of data about the Labour Party's political ideologies and policy positions, as well as charting their changes over time. The volume has a new introduction written by Dennis Kavanagh, who is Professor of Politics at Liverpool University, and who has already published Political Science and Political Behaviour with Routledge. In addition to the new introduction, the volume includes a comprehensive index, making the volume easy to use. Dennis Kavanagh is Professor of Politics at Liverpool University. He has already published Political Science and Political Behaviour with Routledge.